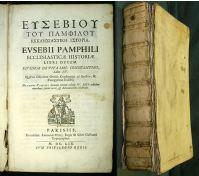 Church History, Life of Constantine, Oration in Praise of..
Church History, Life of Constantine, Oration in Praise of Constantine by Eusebius Pamphilius is a classic which rank in significance with the works of Flavius Josephus. What Josephus did for the Old Testament and Intertestamentary period, Eusebius did for the New Testament era and for the early years of the post-Biblical church history. The present translation of the Church History of Eusebius has been made from Heinichen’s second edition of the Greek text.